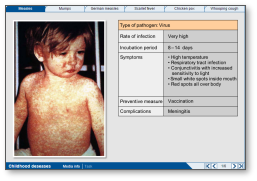 Overview of typical childhood diseases and their symptoms in form of clickable tables. 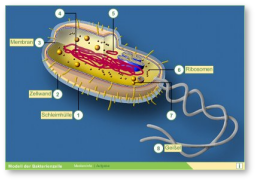 Explore the structure of a bacterial cell an get information about the function of the structural components. You need Adobe Shockwave to play this module. Does not work on iPad yet. 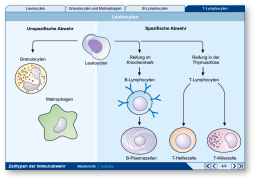 Study the exponential growth of bacteria and the dependence of bacterial growth of time and temperature. 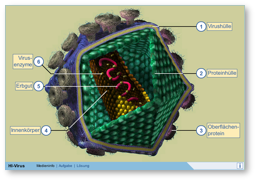 Investigate the structure of a virus and guess the specific function of each component. You need a HTML5 compatible Browser. 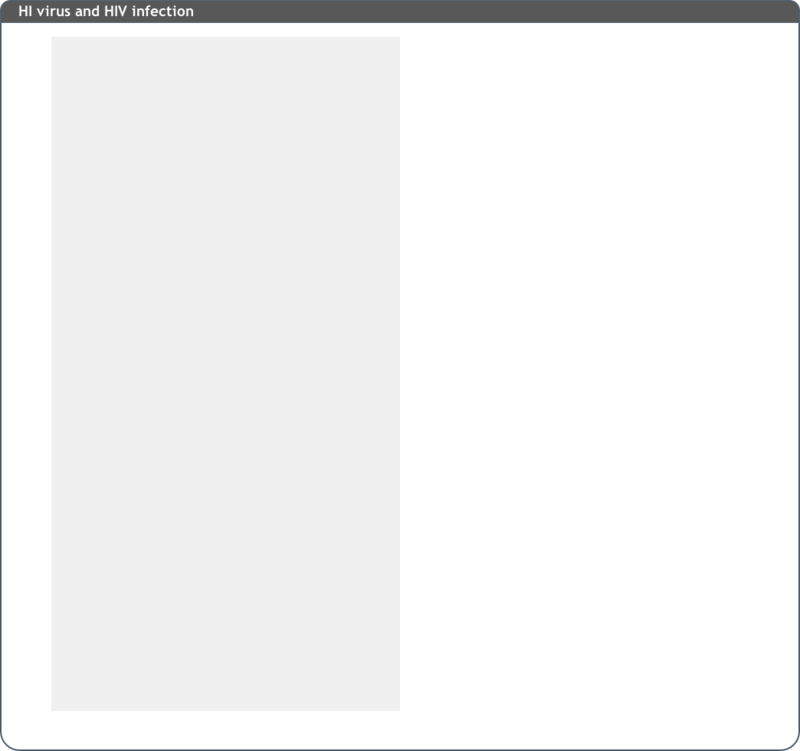 Assess your knowledge of viral infection by arranging the stages into the right order. 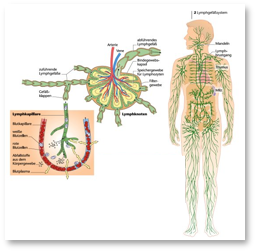 Discover the lymphatic system in some kind of submerge journey and thus understand this system as the central organ of our immune system. 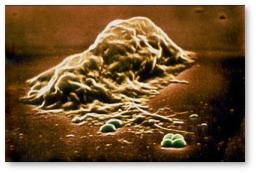 Observe a white blood cell during phagocytosis of a „foreign body“. 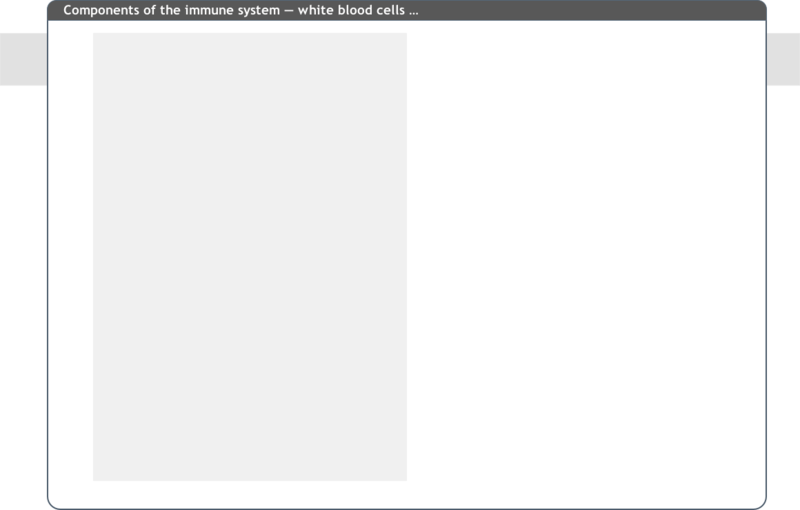 Experience white blood cells as part of the basic immune response. 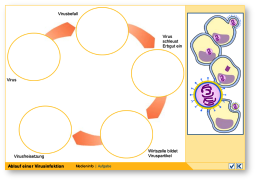 Get a basic overview to the cells that play a part in the non-specific and specific immune response. 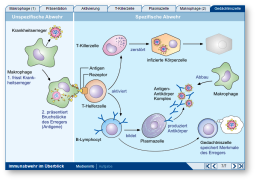 Work out in detail the various cells of our immune system, that are part of the arsenal of immune response. Watch the cells of immune respone in action. 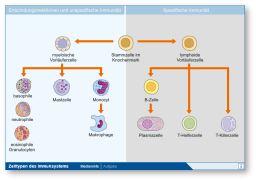 Understand the chain from non-specific to specific immune response. 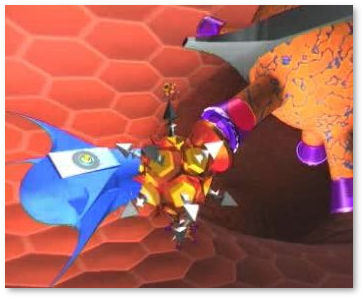 Experience the entertaining story beginning at a macro-phagus cell and ending at a T-killer cell. Cell-cell-recognition works with specific receptors on the surface of the cell membranes. 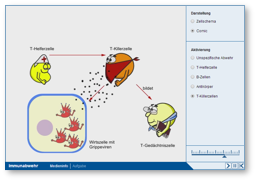 Watch and understand the mole-cular mechanisms of the immune response. 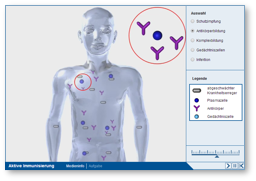 Become part of a video quest and observe the immune response in an animated scene of a crime 3D-microcosm. Re-discover the vaccination by Edward Jenner and experience a milestone in medical history. 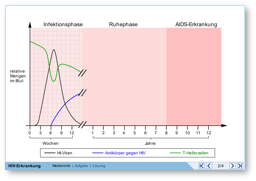 Weakend antigenes are injected for example in a horse. 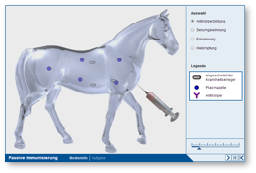 Observe the production of antibodies in a virtual zoom to the processes in the blood of the horse. 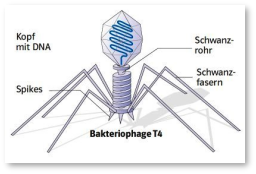 HI virus and discuss the function of each structure. Describe the typical phases of virus infection with help of a step by step trickfilm. 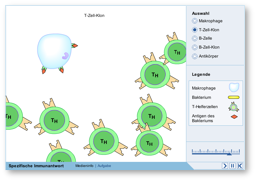 Explain the fatal strategy of the HI virus by using T helper cells as hosts. 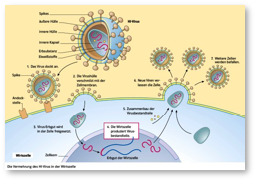 Understand the difference between infection, incubation and illness (AIDS). 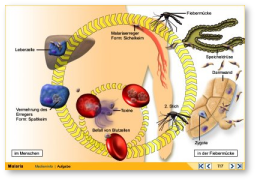 Two hosts are involved during Malaria infection. 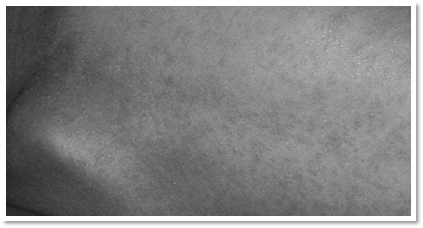 Work in collaborative groups to discribe the pathogenious way from Anopheles mosquito through human host and back to mosquito. 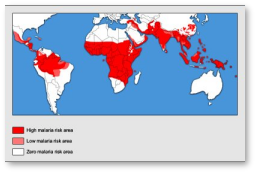 Visualize and get an idea of the time periods that are needed to spread malaria all over the world. Reflect your own behaviour on the effect of malaria propagation. 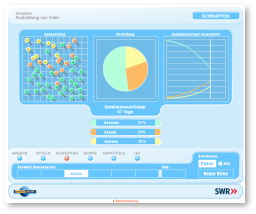 Understand and predict the dependence of disease, virus trans-mission and propagation by choosing various options in a simulation. Does not work on iPad. Click the button to select your language. Pilot teachers will find a blank assessment form for download. Just click on the preview above. Basic information for this lessons are already prefilled in the form. 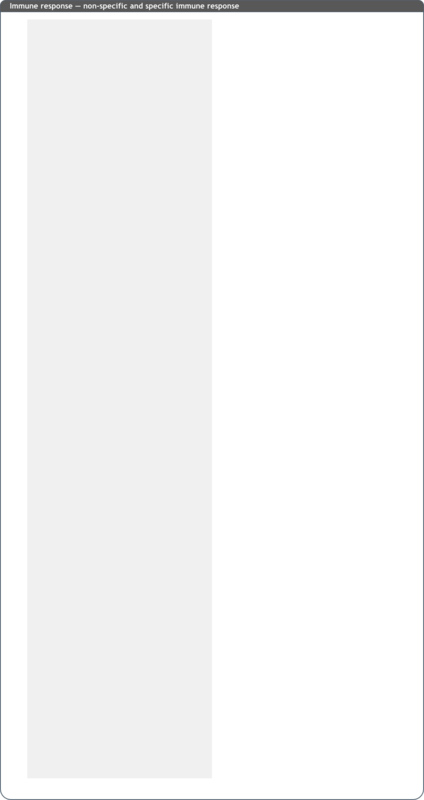 The form is provided as an editable Word™-Document.